Updates to Olivia Dee's profile since your last visit are highlighted in yellow. Olivia Dee Jeffcoat Pugh has a birthday today. Olivia Dee Jeffcoat Pugh added a comment on Profile. Olivia Dee Jeffcoat Pugh posted a message. New comment added. Olivia Dee Jeffcoat Pugh updated profile. View. I hope that you have the most beautiful day my friend:~) I know that your precious family will be celebrating with you on this special day. Lots of love my friend. Olivia Dee Jeffcoat Pugh posted a message. Happy birthday Bill;-) I hope you had a wonderful day!!!!!?????????? Olivia Dee Jeffcoat Pugh has left an In Memory comment for Profile. May God bless Bubba Buehler and his family. He was a wonderful man with a beautiful soul. I first met Bubba in the 7th grade. After school Bubba would walk behind my cousin Vickie and myself every chance he got. Vickie lived a few houses down from him. I have to say, he harrassed us every foot of the way. He never stopped talking and he drove us both crazy! :~) He was always kind and I have never heard him say a bad thing about anyone. I have only seen Bubba once in all these years but, he was the same Bubba to me as always. The same rosy cheeks:~) and that same old sweet smile. I have and will always cherish his friendship. Rest in peace my friend. I am glad to see you so happy Linda. Your husband is quite handsome! Take care. Olivia Dee Jeffcoat Pugh added a comment on Grover Cleveland Glenn's Photo. New comment added. You probably don't remember me from high school but, I read your post about Bubba and the fact that you lost your 16 year old granddaughter. I have to tell you, my heart goes out for you and your wife and family. I have a 10 year old grandson that I love more than the very air that I breathe. I can not imagine your pain. You and your family will be in my prayers. Happy Birthday to my beautiful friend..
My beautiful daughter, Stephanie, and her precious son,Gus. The two loves of my life. I am truly blessed! 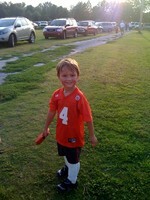 My sweet Gus at his first soccer match. Gus loves the beach and I love it when they come for a vacation here a couple of times a year. This is my little "funny face" when he was little. This baby came into the world smiling and happy!